It’s time to get Orchis Tower going again, after an involuntary break induced by an overflow of other, teaching-related work. Followed up on my China feeds today. Read and tried to digest a few hundred blog posts. Mostly about the Tibet crisis, mostly depressing, with a lot of noise. Some signal – like most entries on the very good China Beat. I especially liked this posting, which is pre-T, but highly applicable to the issue. Another interesting item was this article on The Guardian’s Comment is Free website. Its author, Pankaj Mishra, also contributed a portrait of the Dalai Lama in a book review at The New Yorker, a little too favorable to my liking, e.g. sparing the reader the tibetan leader’s known involvement with several bloody CIA plots in times of the Cold War. Many German media really did a poor job (follow the link and scroll down for some examples) during the Tibet crisis. Even experienced China correspondents like Kai Strittmatter (Süddeutsche Zeitung) contributed biased and clichéd reporting. And, especially with the Germans’ infatuation with the Dalai Lama, the willingness to come to uninformed and quick conclusions seems to have been overwhelming. There have been exceptions, of course, like an early interview with Georg Blume, a ZEIT and TAZ correspondent who was at Lhasa during the first days of the riots, or this thoughtful article at Frankfurter Allgemeine Zeitung about the communication breakdown between chinese and western media. But even the Blume interview was tainted by the editorial staff of SPIEGEL ONLINE with a misleading headline. “China’s New Intelligentsia”, this month’s Prospect title story by Mark Leonard, provides for some highly fascinating reading. Even though Leonard does not cash in its headline’s ambitious promise, he quite efficiently places the thought of some Chinese intellectuals into the context of The Middle Empire’s recent internal and external actions and development. In my eyes the foremost value of informed articles like this one consists in the fact that they serve as an invitation not to talk about, but enter into a discussion with people representing widely differing world views, presenting them not as naive or even as authoritarian brutes, but as people quite able of giving reasons for their positions. Let’s face it: Liberal western democracies may have had their high time during the 90s, but more and more they are experiencing a legitimacy crisis, due to many factors: the US’ rapid descent into unilateral authoritarianism, a declining trust into the traditional party systems, the diminishing credibility of the media as a safeguard of public knowledge and awareness, among others. Of course we’ll still hold that free media, free and secret elections, the division of power, a system of checks and balances etc. are all necessary ingredients of any really good form of societal organization. But this might not be as self-evident as it seemed to us after years of liberal complacency. And it is not only for the sake of human rights in some places we haven’t even begun to understand that we have to re-enter the market-place of ideas and test or defend our positions. It might turn out that the pragmatic discourse of some Chinese thinkers could help us come to grip with some of our domestic problems as well. Saturday evening I’ve met Héng Gē (横戈), CEO and founder of Blogbus, the oldest independent blog service in China, in a small café opposite of the Shanghai Public Library. Heng Ge, whose regular name is Dòu Yì (窦毅), founded the service in late 2002. With more than 4 million accounts they are not the biggest, but probably the best-reputed blog service in China, sporting a lot of users from the oh-so-important “creative class”. They don’t do advertisement for the service, just word-of-mouth campaigning. More than twice as many Chinese respondents agreed that “I have experimented with how I present myself online” (69 percent vs. 28 percent of Americans). As was to be expected, James Fallows’ article on China’s Internet control system, “The Connection Has Been Reset”, is an excellent one, well-informed and balanced. Funny enough, when I followed Fallows’ recommendation yesterday and downloaded the software for a “virtual private network” (VPN), I experienced exactly one of the measures described in his article. Sitting in a café, I was able to read the homepage of the VPN company, but when I wanted to order the product, the connection was blocked for some minutes. Update Feb 28, 2008: There is an additional interview with James Fallows online at the Atlantic’s website: Penetrating the Great Firewall. On December 23 I was witness (always painfully conspicuous as a foreigner) to the year-end meeting of Sohu’s featured bloggers. All the big chinese portal providers also serve as blog hosters, some with millions of bloggers each. Most of the active bloggers in China have several blogs, hoping to be featured here and there by their hosts on the portal homepages, an instant guarantee for thousands of additional pageviews and a lot of face. So in most cases the different blogs are not filled with different entries, but the contributions are simply copied and pasted to the different blogs. But real bloggers or not, it was fun. There was a lively discussion about the most significant events of the last year (Needle house? Ant Farmers? Lust, Caution?) and even some semi-serious breast-beating for not being more courageous in face of the usual attempts to ‘regulate’ the chinese blogosphere. Some self-declared poets bickered with the attending news bloggers about the proper use of words. Finally, a little boy, son of the director of Sohu’s weblog department, entered stage for a saxophone solo and you could see the pride in the eyes of his father holding the score for his talented offspring. The Mindmeters website was founded in May 2003, originally as an online magazine providing space for contributions made to the Book Review supplement of the Economic Observer weekly (english). In Chinese the name of the website is 思维的乐趣, sī wéi de lè qù, The Delights of Thinking. The wonderful english title was coined by Qin Liwen, then senior reporter at EO, now head of Sohu’s News Center. One and a half years later, in October 2004, the core of the Mindmeters website was changed into a group weblog. After the majority of Mindmeters’ contributors, something like 10 senior writers, left Economic Observer in the summer of 2005 out of frustration with the paper’s narrowing intellectual scope, Mindmeters became an independent weblog and one of the most interesting experiments in independent group publishing I know of. 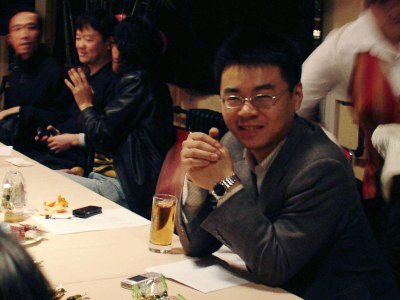 The spiritus rector of Mindmeters is Fang Jun (方军), Beijing-based management expert and now head of Sohu.com’s culture department (picture above). The portfolio of contributors includes people like Wu Xiaobo (吴晓波), whose history of New China’s early entrepreneurs is considered to be the best treatment of this subject; Xu Zhiyuan (许知远), renowned essayist and designated biographer of Hongkong tycoon Li Ka-Shing; journalist and writer Zou Bo, (邹波) or Ye Ying (叶滢), head of the Lifestyle department at Economic Observer. Originally there were less than 10 founding members, now the number of listed members is up to more than 50, but still there are no more than around 10 highly active contributors. The topics range from management theory and history to architecture or arts and literature. There is no commercial ambition in the project, it’s for fun and only for fun. New contributors are recruited like in a very restrictive club: they have to be friends of members. There are no explicit guidelines, everyone is responsible for their own entries. Even the site’s topical banner can be changed by everyone. Of course, Fang Jun is checking the site regularly to make sure there is no crossing the boundaries of decency, political or otherwise, but mostly the blog is a great and courageous attempt in free, distributed thinking and writing.